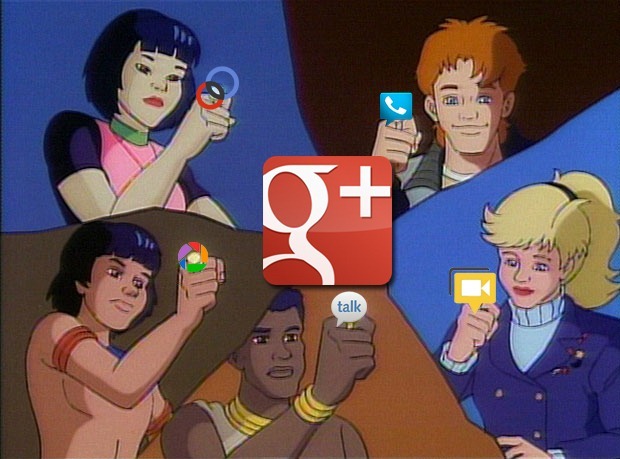 [Editorial] Welcome To Google+: Your Social Network Is Finally Ready, So What Are You Waiting On? Google I/O isn't even finished yet, and everyone's favorite search company has already shaken things up quite a bit. One of the biggest things Google announced was Google Events. Google said that this new feature would allow users to coordinate events and share them with others. What Google didn't say was that with the addition of this feature, Google+ is ready. Cooked until golden brown and ready to be served. And, guys? It's time to dig in. Social networks will continue to evolve as long as people do, but today marked a subtle, yet important transition for Google: the day that the biggest majority of its key features finally became unified in a meaningful, social way. This is the entire point of Google+ which, up until now, was missing one key Google property: Calendar. Let's take a look, though at all of the other properties Google has wrangled up into this platform. One of the most essential pieces of any social network, Google enabled the ability to chat with anyone in your circles that had circled you back via Google Talk. This marked the first time that Google Talk did not require you to know someone else's email address (or AIM username) to chat with them. Keep in mind, this also includes the ability to make voice and video calls with a person if you both have a microphone and a webcam. Oh, and did I mention the ability to place phone calls right from the browser? You can even use your own phone number if you've got Google Voice. Google+ has been, since November, a command center for just about any and all forms of one-to-one communication. Update: Okay, actually phone calls and Voice integration is still limited to Gmail, but video and voice chat is still possible from the main Google+ page. Gmail contacts have always been a powerful tool for keeping track of everyone you know. Circles was introduced alongside Google+ as a new approach to "friends". It seemed like just a simple, one-way follow method for connecting with people on Google's social network, but it's more than that. With integration in Contacts, adding someone to your phone book is as simple as putting them in a Circle. All the info they're willing to share, along with photos, is right there. The internet deserves a better class of image editor. One of the biggest abandoned Google properties has now been so seamlessly integrated into the Google+ experience that we've forgotten it exists: Picasa. Forget Picasa, Google+ is now the home for your photos. After integrating Picnik into its photo editing suite, Google made the Photos tab the new home for all your photos. Instant Upload made the ability to save, store, and share photos without ever connecting your device to a computer. An often overlooked feature is that, even if you never share a single photo via Google+, you can still modify, tweak, and download your images. Or just use Google's servers as an automatic backup. More recently, Google added the Local tab, integrating many of Google Maps' best features. The ability to find restaurants, hotels, attractions, and various other places around town. Many of these locations have user reviews, ratings, maps, directions, hours of operation, phone numbers, and more. Do you notice something about all of these features? They have one very interesting feature in common that runs directly counter-intuitive to the idea of a social network: You can use any of the above features from within Google+ without sharing anything with anyone. This is the main power of Google+. This platform is more than just another news feed. It is the centralization of your entire online life. 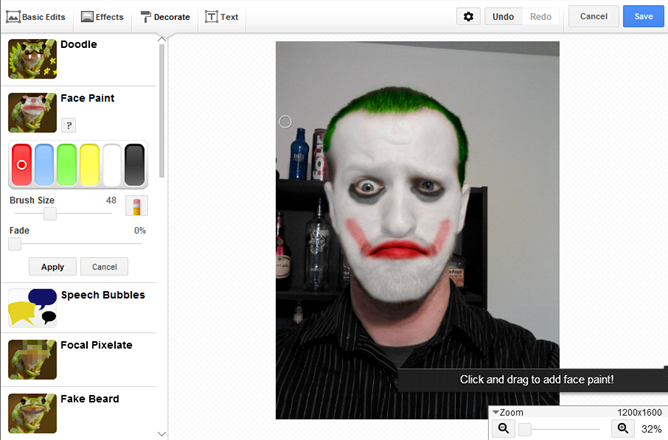 Group video chat is a neat trick, and certainly one of the better features of Google+. However, it's just a matter of time before Facebook implements group video chat, too. Hangouts on Air, however, is an entirely different beast. The ability to broadcast to an audience is a golden feature. From weddings, to graduations, to your friend's bands shows. We even use Hangouts on Air during our weekly podcast (every Thursday at 8pm EST, by the way). Even better than broadcast, though, is that every Hangout on Air is immediately saved as a YouTube video that can be streamed shortly after the event. Toss in Google Drive integration and screensharing, and the possibilities extend further into the realms of business meetings and training videos. Facebook has a great tool for managing events. I've used it for years. One thing I've always wanted, though, is something Facebook failed to deliver (without a complex, half-assed export process that I don't care to criticize). Events from Google+ are now added directly to your Google Calendar. They even get a handy little picture of the creator of the event next to them to indicate social events. You can even see the Event invite from within Calendar. More importantly, while on an Event page, you can see what you've got on your itinerary around the time of an event to see if you're free. Until Facebook has a full-fledged calendar, the company can't do this natively. Oh, and there's one more thing Facebook can't do (sort of), and it's the entire reason that Google+ doesn't actually compete with Facebook. Facebook isn't Google's main competitor. That title belongs to both Apple and Microsoft. No, it's not because Facebook doesn't have a mobile OS. It's because Facebook doesn't have the scale nor the desire to do all the things that Google does. For the reasons mentioned above, Facebook will have to build a metric ton of new features to compete with Google as a platform. But what about just as a social network. Surely Facebook is Google's main competitor when it comes to social, right? Nope. You know who it is? It's a widely known, yet often overlooked fact that Google does not use "friends" on Google+. Instead, the company allows you to add people, organizations, or businesses to your "circles". This is a relationship that does not need to be mutual. This is much more in line with Twitter's model. A model that differs very much from how Facebook operates. Google+ doesn't need to compete with Facebook because, unlike Facebook, Google+ doesn't need all of your friends and family to join in order for it to be successful. Here's how the difference works: If your Facebook feed is full of inane crap and annoying garbage, get better friends. If, however, your Twitter feed is full of worthless material, follow different people. Because you don't need people you follow on Twitter to follow you back, you can craft a feed of interesting topics from a wide variety of personalities. I follow everyone from webcomic artists to celebrities to tech blogs to people who are just good at sharing interesting links on Twitter. Twitter (left), and Google+ (right) bother offer feeds of news and information from people I both know and don't know, as well as headlines from news organizations. This is how Google+ works, only with much richer content, and integration with a lot more of the services you use every day. I can look at a photo, watch a YouTube video, read a blog post, or engage in a conversation with people from a wide variety of places, backgrounds, and topics. The Explore tab on Google+ is a catalyst for finding new people to circle, but it works just as well by keeping an ear out for anyone interesting you meet. In person or online, Google+ has a way to connect with them. That's the point. That's always been the point. Lest I forget, this is the internet I'm dealing with, and there are all manner of people here. Some of you absolutely love Google (in fact more of you likely do than not, if you're reading this site). Others honestly believe that Google is the beast that the End Times prophecies in the book of Revelations spoke about. We'll never all agree and that's great. Brilliant, in fact. I'd hate a world where we all have the same views on everything. However, the "no one's on Google+" argument is dead. We'll leave the discussion about whether or not Google's stats on userbase are accurate (those stats are that 75 million people log in to Google+ every day, and that the average time spent on G+ is 12 minutes, for the interested), the fact is more people are using it now than there have been in the past. As Android, Google, and indeed the whole of the internet grows, that number is going to get bigger. Maybe you're not going to be part of that group. That's cool. You don't have to be. And not even in a passive aggressive, "Fine, I don't want you there anyway" kind of way. Seriously. I have friends that adamantly refuse to use Facebook, Twitter, or Google+. I still socialize with them just fine. People are what matter, not platform. I want to stress that. People matter, not platform. But like it or not, Google+ is here to stay. And it's great. If you want to use it. If you don't, then it's yet another thing for you to ignore on the internet. Sometimes it might be hard to ignore because Google is everywhere. I'm sorry about that. I wish Google would be less obnoxious about sticking Google+ in your face. Especially in search results. But even if the company backs off on the obnoxious intrusions, Google+ isn't going to disappear. Google isn't just a search engine anymore and Google+ has finally become everything Google wanted it to be since it started this project last year. And, honestly, it's not that bad. It fills a need. Just like Twitter and Facebook fill a need. 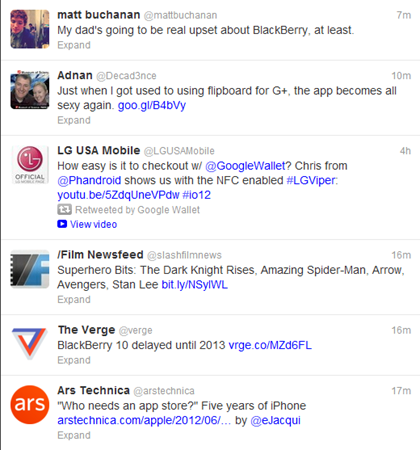 There seems to be a mistaken idea in the tech world that there must be one social network to rule them all. It's simply not true. Facebook exists to chronicle your life and connect with your friends and family. Twitter is for following what's going on right now in the world. Google+ is for engaging in rich content both near and far. All three have their place.